Songs From The Levee (re-issue) is digitally re-mastered and contains five previously unreleased tracks, including an alternate take of “Like A Buffalo” and acoustic mixes of four other songs from the album. The song “Bury Me In Bluegrass” was honored as “Farm Song Of The Year.” The CD cover artwork is by Carrol Cloar. Songs From The Levee notes are from the debut editon of the Large River Music newsletter (1994). I call “Lanterns on the Levee” the mood song on the CD. The title is from a William Percy book about the flooding of the Mississippi River in 1927. On the surface it may appear as a simple love song about commitment in times of adversity. A deeper meaning for me lies in the undercurrent feeling that some things are eternal. The arpeggio movement of the acoustic guitar and the weaving melodic lines of the viola and dobro further enhance this feeling. “Wild Iris” is my favorite song on the CD. I wrote it after seeing a photograph of my grandmother that my grandfather kept in his wallet for over sixty years. It made me wonder what she was like as a young woman. I realized I had always thought of her as an old person. I wanted to write a song that portrayed her in a different light and also told of my grandparents’ love for each other. I like the contrasting sounds of the accordion and slide guitar. “Serious and toungue-in-cheek” may sound like a misnomer, but that’s how I describe “Like a Buffalo.” Fun and upbeat, the mandolin gives the song a “live” feel. It is one of my favorites to perform with the band. “The Locust Years” is very personal to me because I identify with the lyrics so much. Other people as well have been deeply moved by this song. The subtle percussion and haunting viola create just the right mood. “A Cotton Field Away” is another autobiographical song. I was in the fourth grade when they desegregated the schools. This change had a profound impact on my life. The organ solo in the fade is my favorite musical section of the whole CD. “Jerusalem Inn” reflects my memories of some people in the church who looked down on folks different from them. This kind of intolerance has always bothered me. The song has a good groove and pulls you in immediately. I wrote “Trains Don’t Run From Nashville” from a personal experience. I wanted to take the train from Nashville to the northeast but realized I couldn’t. The trains stopped running in the early seventies and except for a remodeled hotel in the front of the building, the old Nashville train terminal now stands decrepit. The droning “open D” guitar tuning conveys a yearning for the return of the trains and the loneliness of a long-distance love. I actually wanted to write a song called “West of Everything” but my producer said “South of Everything” would better suit the theme of the CD–and he was right! I was working on a traveling song at the time and we ended up combining the two ideas into one song. I love the dobro in the second verse because it matches the feel of the lyric so well. “Bury Me in Bluegrass” weaves the stories of my maternal and paternal roots. Whenever we gather for family reunions, I like to walk across the field to an old family cemetery. It is there I am reminded of my own history and also realize that the ways and land of my forebearers will one day be gone from us forever. 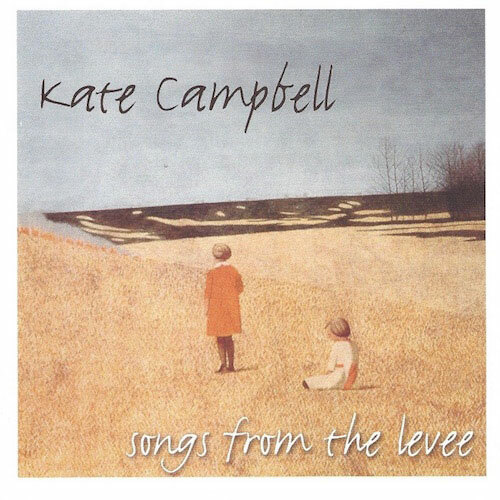 Kate Campbell’s debut album, Songs From The Levee, on the Compass Records label, addresses social issues, paints pictures of her past and conveys her stories along with straightforward melodies. Whether the album cut is autobiographical or a homespun tale, they convey an understanding of the nuances of southern living. Although she is from the Mississippi Delta, she is not a blues singer. She sings her own folk songs and plays guitar with a back-up band. Kate Campbell’s songs create beautiful musical folklore by weaving a tapestry of tales with trains, rivers and landscapes. The universal images used in Songs From The Levee triggered memories from my childhood: camping on Valcour Island with my family and skipping stones across the Brandywine River. Kate Campbell was born in New Orleans, but spent her early years singing Sunday services at her father’s Baptist church in Sledge, Mississippi. After receiving a Masters Degree in Southern History, she moved to Nashville to teach college history and work on her songwriting skills. “Jerusalem Inn”, one of the most uplifting cuts on the Songs From The Levee album was influenced, both in theme and imagery by Campbell’s early diet of gospel music. ” Wild Iris”, another of my favorites, is a playful story of one woman’s lifelong love for her mate. Kate Campbell’s lyrics reflect her talent as both historian and songwriter. She is able to blend history, memories and music into each song she writes. “A Cotton Field Away” takes a personal look at integration. “Trains Don’t Run From Nashville” laments the brutal effects of technology on the culture, and “Bury Me In Bluegrass” which appears to be a protest song about family farms turning into shopping malls, is actually a love story about a family, which deeply cares for their land after they sell it. Songs From The Levee is an inspiring collection of well-crafted songs, clear vocals and simple direct arrangements. Kate Campbell is an intriguing and enthusiastic storyteller. She gives her listeners ample reason to look forward to album number two.